RPPW.org is a community resource for those engaged in the scientific study of rhythm production and perception. It has emerged out of a loose community of psychologists, neuroscientists, and cognitive scientists who share an interest in the understanding of rhythmic aspects to human experience. . Rhythm is at the core of a wide range of human tasks, from speaking and dancing, to walking and synchronising with others. The biannual workshop is focused on the scientific study of the broad area of human movement timing and time perception. The principal vehicle of the community is a biannual workshop, held in various picturesque locations in Europe (and soon, America!). It is focused on the scientific study of the broad area of human movement timing and time perception. The 17th RPPW will be held at the Park Place Hotel in Traverse City, Michigan, USA from the 17th to the 20th of June 2019. RPPW is an international biannual event that brings researchers from a range of disciplines together to engage in discussions about the scientific study of rhythm. Rhythm is at the core of a wide range of human tasks, from speaking and dancing, to walking and synchronising with others. The workshop is traditionally centred around psychology and neuroscience, but we encourage participation from other relevant disciplines. The workshop will host oral presentations, posters, and tutorials with satellite activities. The website and submission portal are availalble at rppw.grahnlab.com. The meeting is organized by J. Devin McAuley (Michigan State University) and Jessica Grahn (University of Western Ontario). They are reachable at rppw2019@gmail.com. The 16th RPPW was held at the Digital Media Technology Lab in Birmingham City University’s Millennium Point Campus in Birmingham, UK from the 3rd to the 5th of July 2017. RPPW is an international biannual event that brings researchers from a range of disciplines together to engage in discussions about the scientific study of rhythm The workshop is traditionally centred around psychology and neuroscience, however this year we were additionally encouraging participation from the Music Information Retrieval Community to encourage cross-pollination and interdisciplinary collaboration. The workshop hosted oral presentations, posters and tutorials with satellite activities. RPPW was held once again in Amsterdam: the third time the meeting has been held in the Netherlands. The workshop took place from July 6 to 8, 2015. A jolly good time was had by all. Here is the website: http://www.move.vu.nl/rppw15. The 14th RPPW was held at the University of Birmingham, UK between 11th and 13th September 2013. The 14th RPPW consisted of three days of talks and poster sessions plus an optional satellite workshop held on the 10th September, covering methods and analysis of multi-person movement timing. The organising committee was: Prof. Alan Wing, Dr. Mark Elliott, Dr. Max di Luca, Dr .Juliane Honisch, Dr. Kim Quinn, Dr. Satoshi Endo and Danni Sims. In keeping with past tradition, here is a link to photos of the event. Rhythms in Scotland was a workshop programme funded by the Royal Society of Edinburgh. There was a series of events on rhythm in Glasgow and Edinburgh during 2011-2012, culminating in a three-day international workshop, Perspectives on Rhythm and Timing (PoRT), in July 2012. Autumn 2011: Two half-day tutorials on rhythmic aspects of English as foreign language at the University of Glasgow. A half-day seminar on rhythm models held in March 2012 at the Speech and Language Therapy (SLT) Unit of the University of Strathclyde. A one-day symposium, Approaches to Rhythm and Timing in Scotland Today (ARTiST), held in April 2012 at the University of Edinburgh. A three-day interdisciplinary workshop, Perspectives on Rhythm and Timing (PoRT), held at the University of Glasgow, UK, on July 19-21, 2012. A special issue of Transactions of the Royal Philosophical Society B based on talks from PoRT was published in December 2014. 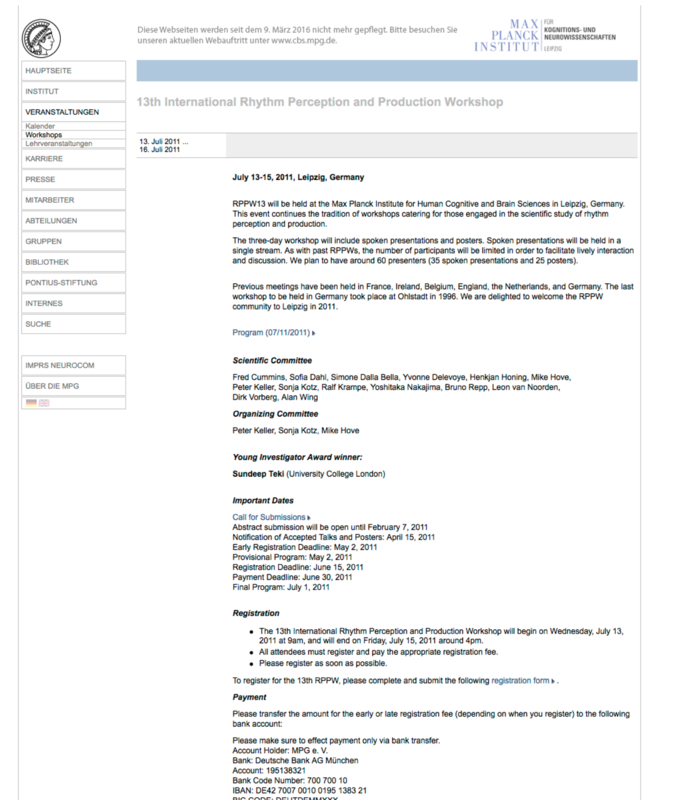 RPPW 13 was held at the Max Planck Institute for Human Cognitive and Brain Sciences in Leipzig, Germany, from July 13 to 15, 2011. The website seems to have gone, but here is the original call for submissions, and here are a few pictures. The 12th Rhythm Production and Perception Workshop (RPPW 2009) was held in Lille, France from July 15th to 17th, 2009. The workshop was organised by Yvonne Delevoye-Turrell and took place on Lille University campus. Information and pictures are available here.